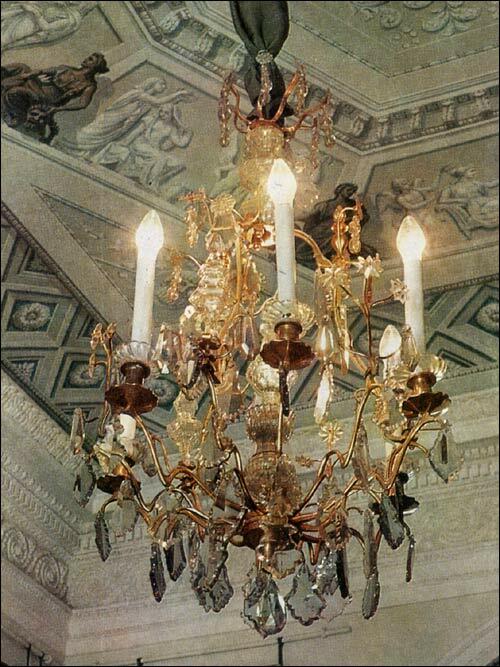 The apartment known as the Family Sitting Room was used by the family of Paul I for spending the evenings in practising different accomplishments: drawing, cameo-cutting, embroidery, etc. 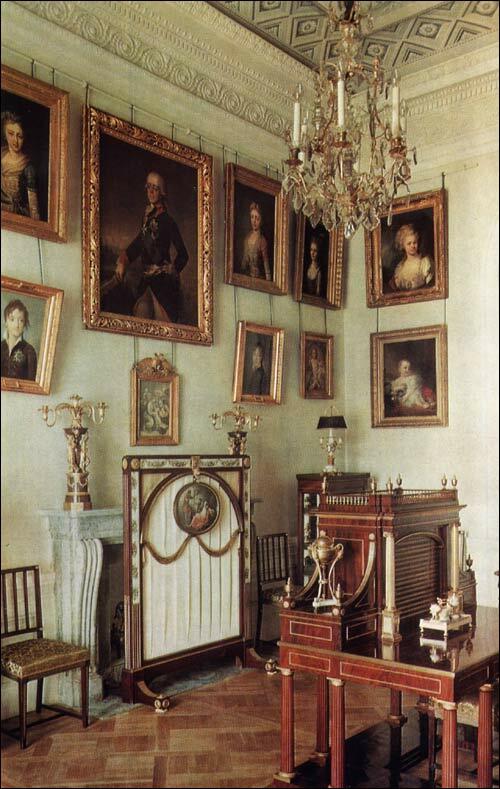 Its walls were hung with family portraits executed by prominent Russian and Western European artists of the eighteenth and early nineteenth centuries, such as Vladimir Borovikovsky, Orest Kiprensky, Stepan Shchukin, Johann-Baptist Lampi, Johann Tischbein, Josef Grassi; one of the portraits, a large canvas, is by Gerhard Kugelgen; it was painted in 1800-l. The Family Sitting Room retains the modest decor given it toward the close of the eighteenth century by Vincenzo Brenna. Its walls, painted a uniform colour, are finished with a frieze of delicate moulded ornaments on a lightly tinted background. The ceiling is done in grisaille. Its central panel has a border of classical scenes, one subject being divided from the other by the introduction of a painted sculpture, the colour of antique bronze, of Apollo and the Nine Muses. The painted decorations are probably the work of Giovanni Scotti. The furniture is mostly mahogany, of Russian make. The large bureau decorated with architectural motifs: columns and a balustrade of bronze, was made in 1786 in the workshop of David Roentgen. Objects in ivory and amber, carved from the drawings of Vincenzo Brenna and Carlo Rossi, adorn the tables and the low bookcases. 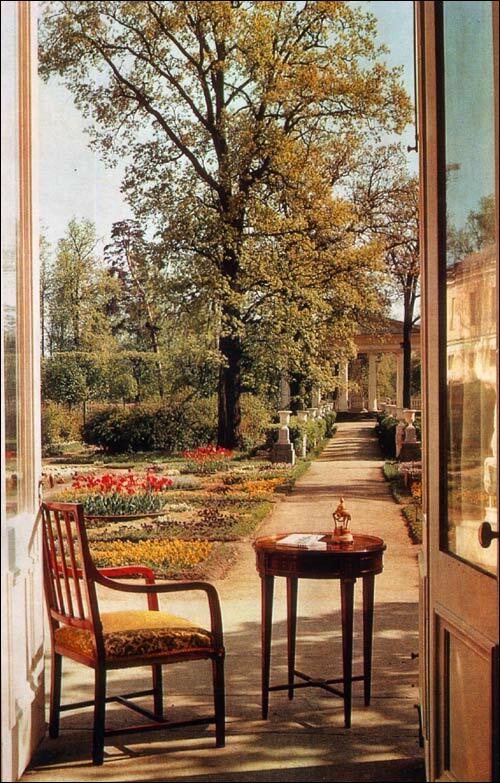 Through the French window opening upon the paved terrace built by Giacomo Quarenghi can be seen the walks and flower-beds of the Private Garden.